Have a JoJo gift card and want to check your balance? Click here. JoJo Maman Bébé has grown to become the UK’s leading mother and baby boutique brand. JoJo is known for very high quality, imaginative, practical clothing and products for pregnant women and families with young children. A JoJo Maman Bébé gift card is therefore a great choice for expectant parents, or as a christening gift. JoJo Maman Bébé has stores throughout London and the United Kingdom – click here to find your nearest JoJo store. JoJo Maman Bébé has grown from a small company operating out of spare warehouse space in Newport, Wales to a 700-strong company serving 40 countries, whilst always showing loyalty to their staff in Wales and a commitment to putting environment and people before profit. Have a look at their information page for more about this sustainable and charitable success story. How can I check my JoJo Maman Bébé gift card balance online? You can check the balance on your JoJo Maman Bébé gift card online by visiting this page. If you have an e-gift card rather than a plastic JoJo gift card don’t worry, you can also check the balance of that here. You can also get the current balance by handing over the card at any JoJo store. You can call JoJo’s customer service team on 0871 423 5656 to get the balance. This number is operated by JoJo Maman Bébé. Please note calls to 0871 numbers cost 10p per minute plus your network’s access charge. 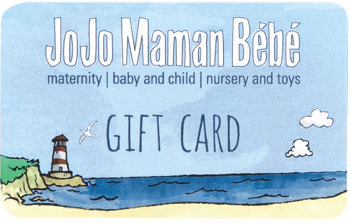 Where can I buy JoJo Maman Bébé gift cards from? You can pick up the gift cards at any JoJo Maman Bébé store. Click here to find your nearest JoJo Maman Bébé store. The can also buy the cards online from the JoJo Maman Bébé website. Click here for the gift card purchase page. JoJo e-gift cards are available to buy from their website – these are delivered instantly to your intended recipient’s email address or, you can also sent the gift to your own email address to print off and give – perfect for that very last-minute gift. Anything else I need to know about JoJo Maman Bébé gift cards? Cards are activated on purchase and are valid for 12 months from the date of purchase or last use. ‘Last use’ includes purchases made at JoJo stores or online, or refunds made to the card. ‘Last use’ does not include balance enquiries. Any balance left on the card after 12 months of inactivity will be lost.